Black grape combined with ripe berry and other fruits alike produces this delicious grape juice. The bitter exhale taste of grape is topped with the taste of berry to create a taste that you will never get bored of. You won’t get the burning taste like you always get fro.. The Slim 2R tank is durable, has a filling capacity of 2ml and allows easy and clean filling. 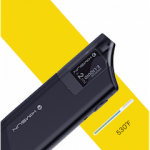 The cartridges have an extended life, this is down to the temperature control protection built in the the Slim 2R kit, as soon as you are out of liquid the slim 2R will automaticall.. 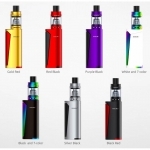 The SMOK ProColor 225W TC Starter Kit is the latest masterpiece from SMOKTech's advanced systems, delivering a visually striking ProCore 225W Mod with customizable 12-Color LED backlight and new full-color OLED to pair with the dynamic TFV8 Big Baby Tank. The P.. Product Introduction: Among TFV8 series with stylish bottom airflow system, SMOK TFV8 X-Baby features top airflow with redesigned structure and coil. The classical swivel top cap design makes refilling and leak -proof easier. 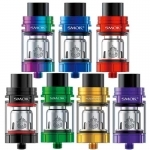 TFV8 X Baby tank provides a new experience - ma.. 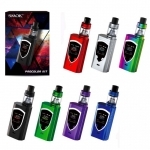 Product Introduction: The new SMOK Priv V8 Kit consists of a Priv V8 MOD and a TFV8 Baby tank. The fashionable colors available elevates the Priv V8 MOD's appearance and certainly attracts attention. Its compact size brings convenience for daily use too. Priv V8 featu..
An Asalt on an instant classic. Born a legend, Glazed Tobacco is an immediate assault on your senses. Praised by the vaper faithful of the world for it’s wickedly smooth tobacco flavor, this bold vape juice blends hints of hazelnut, vanilla, almond and caramel, Glazed T..
Lost Art Liquids - "?" Mystery Flavor 60 ML D..
Lost Art Liquids - Cottontail Cream 60 ML The..
Lost Art Liquids - Gummy Glu 60 ML Gummy Glu ..
Lost Art Liquids - Kaptain Peanut-Butter Krunch 60 ML ..
Lost Art Liquids - The Beez Kneez 60 ML Enjoy..
Lost Art Liquids - Unicorn Puke 60 ML What be..
Lost Art Liquids Space Rockz 60 ML A sweet an..
O.G.B now available in 60ml unicorn bottles in a Max VG (85VG/15PG) blend. O.G.B is a blue ra..
Slotter Pops by Lost Art 60ml Slotter Pops by..
Slotter Pops Grape White By Lost Art 60ml The..
A candied strawberry bubblegum ready for the big leagues! Available in 120ml tamper evident U..